Iran and France can work together to end the ongoing destructive wars in the Middle East, specifically in Syria, says a senior Iranian official. Ali Akbar Velayati, who advises Leader of the Islamic Revolution Ayatollah Seyyed Ali Khamenei on international affairs, made the remarks on Wednesday during a meeting with President of France’s National Assembly Claude Bartolone. The French official arrived in Tehran on Monday at the head of a parliamentary delegation and is to stay in the Iranian capital until September 9. “France has a longstanding record in Lebanon and Syria. Iran, too, enjoys good influence in these regions. 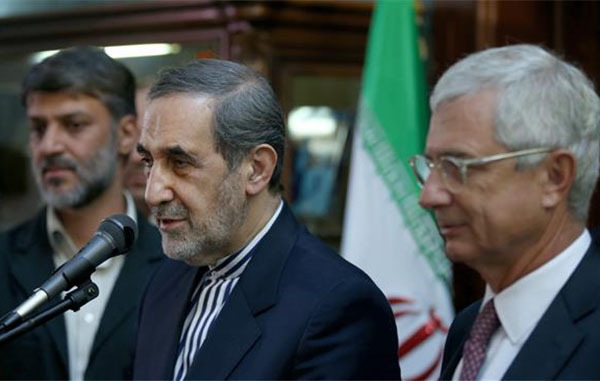 They [Iran and France], therefore, can end these destructive wars through cooperation with each other,” Velayati stated. “At the present time, both countries are faced with terrorism and both are against this phenomenon. Should these bilateral meetings continue, the two sides’ interpretations of terrorism would further converge,” Velayati noted. Bartolone, for his part, expressed delight at “direct good and straightforward” exchanges he has had during his meetings so far with Iran’s President Hassan Rouhani, Parliament Speaker Ali Larijani, and other Iranian officials. The French official further laid emphasis on the need for international agreements to address such important international issues as terrorism, climate change, money laundering, and corruption. Earlier on Tuesday, Bartolone had met with Secretary of Iran’s Supreme National Security Council Ali Shamkhani. The Iranian official noted during the meeting that some Western parties are after deepening and perpetuation of crises in the Middle East, warning, “Any talk about changing countries’ political map and geographical frontiers will intensify conflicts and tensions,” he warned. He said those areas in the war-stricken Arab country, which are controlled by Daesh and al-Qaeda, are in urgent need of aid, adding that sanctions imposed on the Syrian government, which bar aid delivery to these areas, flagrantly contradict humanitarian approaches.